It would appear reports of Mantle’s demise aren’t true – we decided to do a little investigation into this news story ourselves, and AMD have firmly denied this rumor. I spoke with Robert Hallock, who serves as AMD’s Head of Global Technical Marketing and he assures me that this isn’t the case, and AMD plan to continue the development of the API. “This is simple: absolutely not,” said Hallock when I asked him if the earlier reports were true. Earlier – While some in the tech industry were hostile to AMD’s initially introducing Mantle back in 2013, it’s fair to say that their decision to work on the first PC low level API radically altered the shape of the PC landscape. It’s no secret that their technology ‘inspired’ the development of DirectX 12, and was also used as the backbone of Vulkan by the Khronos group, but it’s now emerged AMD plan to halt further development on their proprietary API. AMD aren’t going to simply destroy any and all support for Mantle, but they’re instead planning to let it fade out. It’s not really surprising, now Microsoft’s DirectX 12 and Windows 10 loom in the distance, developers will likely shift towards developing for it, and with both DX12 and potentially Vulkan both competing for developers time, hope of a studio investing even more time into Mantle development was always a difficult task. Several high profile games have supported Mantle, including Thief, Battlefield 4 and Hardline, Dragon Age Inquisition. Upcoming titles include Star Citizen and of the eagerly anticipated Star Wars Battlefront. It’s fair to say that while Mantle is a project (assuming these reports are true) will no longer be its own ‘thing’, it will live on in the spirit of both DirectX 12 and Vulkan. 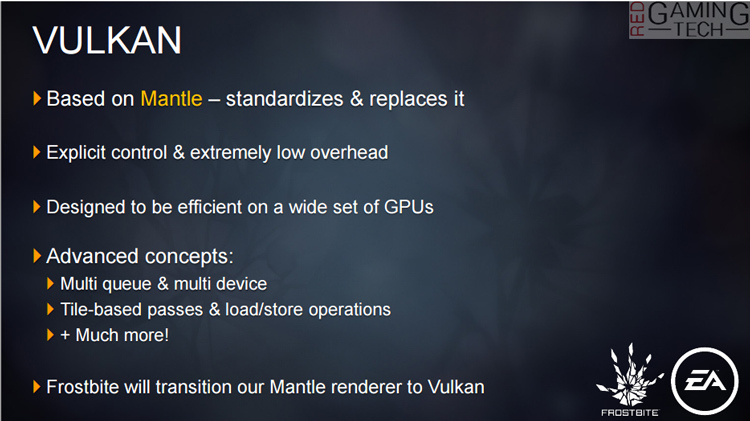 During our early analysis of the Vulkan API it was made abundantly clear by the Khronos group that Mantle lay at the heart of Vulkan. Of course, there are significant differences, and anything specific to the GCN (Graphic Core Next, the current GPU technology AMD use to power their Radeon graphics cards) was removed, because then it would no longer be neutral in performance. Tagged with AMD, DirectX 12, DX12, gpu, graphics, Mantle, radeon, vulkan.